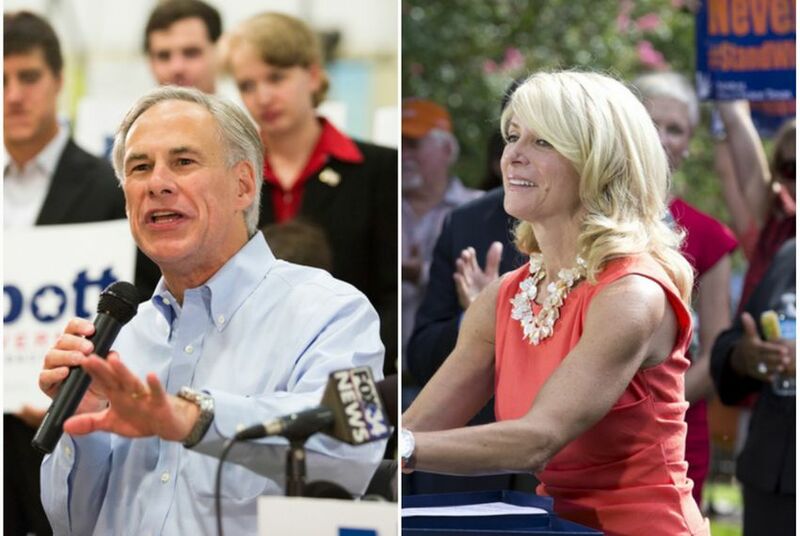 Gubernatorial candidates Greg Abbott (l.) and Wendy Davis (r.). Some people might have been surprised by the University of Texas/Texas Tribune Poll results released Monday, which showed Greg Abbott leading Wendy Davis by 6 points in a two-way contest and by 5 in a three-way race — a single-digit margin for a statewide office that the Democrats haven’t claimed for 20 years. The context of a survey conducted a little more than a year before Election Day clarifies two seemingly contradictory results: a competitive gubernatorial race among registered voters alongside a substantial Republican advantage in party identification and political engagement. The most important contextual factor in viewing Abbott’s 6-point advantage in a two-person race is the rapid, media-fueled increase in Davis’ name recognition among Texans. Since our last poll in June, Davis has progressed from being recognized by only 23 percent of registered voters to 68 percent. In the same time span, Abbott moved from being recognized by 49 percent of the electorate to 60 percent. That’s right: The Democrat is better known than the Republican right now. And it is this state of affairs that partially explains the trial ballot result, which, this far out, is more of a name recognition test than anything else. But it’s important to note that the trial ballot result is also a reflection of the attitudes of registered voters — all of them — and that only a small subset of registered voters will turn out come November 2014 (probably under 40 percent). One solution to this problem is to apply a likely voter screen, something that we’ve written about at length previously. We have tended to not apply likely voter screens this far in advance of the election because their utility wanes as distance from the contest increases. But given the notoriety of this particular result, it’s worth examining what a likely voter screen would do to the outcome. Among those who are (1) “extremely” or “somewhat” interested in politics and (2) voting in “every” or “almost every” election, 49 percent chose Abbott compared with 35 percent who chose Davis. This point spread should look familiar to those who observe Texas elections closely (Gov. Rick Perry beat Bill White by 12 points in 2010). There are pros and cons to using the likely voter screen when looking at the gubernatorial ballot. While we are generally skeptical about the accuracy of likely voter screens this far from an election, our skepticism is more pronounced for presidential races, where interest and mobilization actually occurs, and often occurs late. In midterm elections, turnout effects are huge and interest is almost always low. Indeed, applying the likely voter screen to a midterm election sample provides a conservative estimate of the voting day electorate — conservative because the estimate listed above still includes roughly 70 percent of our registered voter pool, not the 35 percent who will show up come Election Day. The difference in the results is a reflection of the fact that likely voter samples tend to be less Democratic than registered voter samples, and registered voter samples tend to be less Democratic still than adult samples. So as one tightens the screen of whom to include in estimating the result, it’s not surprising to find an electorate more receptive to the Republican nominee. In this particular case, Abbott’s standing improves substantially as one moves to a likely voter screen, suggesting that Davis’ newfound celebrity has not increased the propensity for her potential supporters to tell pollsters that they are interested in politics or that they typically vote. If the election were held today, there is reason to believe that Abbott’s supporters are more likely to show up at the polls than Davis’ backers. At the same time, there are reasons to doubt the likely voter numbers, both as a snapshot in time and as a prediction. At the very least, it’s hard to say what a likely voter is one year out from an election. This race is unique in that both major party nominees are probably assured at a very early stage in the process. But the course that the election is likely to take is far from known. When all is said and done, Abbott could be pulled into the fracas that is the GOP’s lieutenant governor primary (as he already has), Davis could be tied to an unpopular president in a midterm election, both candidates will undoubtedly spend vast sums of money, and all this will occur under a national media spotlight that no statewide race has seen in recent memory. Due to these factors, it’s difficult to say that a likely voter screen that produces the historically plausible electorate showcased above is, in fact, truly plausible. The interpretive complexity lies in the fact that this poll result, like any poll result, provides a single snapshot in time. Like a scene in a movie, it may provide a brief synopsis or even foretell much of the film’s plot arc; but likewise, a changing of the camera’s angle or a few more scenes may completely and unexpectedly change the direction of the film. No single scene tells the whole story, and this result is the opening credits in what is sure to be a blockbuster. Jim Henson, co-director of the UT/TT Poll, directs the Texas Politics Project and teaches government at the University of Texas at Austin. Fellow poll co-director Daron Shaw is also a government professor at UT-Austin. Joshua Blank is manager of polling and research at the Texas Politics Project.